April 13. Romans 12:16. How to Love Part 13: Be Humble. Romans 12:9-16. Let love be genuine…Live in harmony with one another. Do not be haughty, but associate with the lowly. Never be wise in your own sight. Genuine love, or the life of Christ manifested in us (same thing) is never self-focused. Jesus himself came to bring harmony to all mankind – racial harmony, gender harmony, and social harmony. The divide between rich and poor is a deep cavern. In Jesus day it was common to either not associate with the poor or to use them as part of a Patron-Client relationship. The patron would be able to “lord it over” their poor clients. But this is not the way of Christ. Christ is in every believer equally, rich and poor, high and low, regardless of earthly status. The problem of a social divide in our churches today is still very real. Politically conservative Christians still tend to judge the poor as lazy or “sinful,” deserving of their misfortune. While politically liberal Christians tend to villainize the wealthy, classifying them all as greedy and heartless. 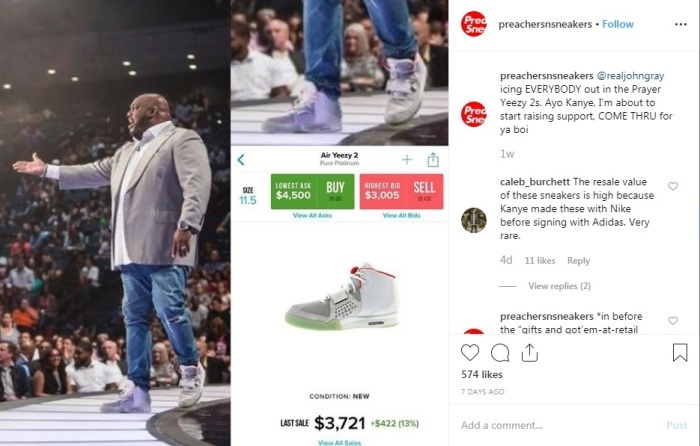 We’ve been reminded this week of this divide, even within the church, as the internet has blown up with PreachersNSneakers, an Instagram account that shows Pastors in their very expensive shoes and swag. Pastors in $1000 sneakers and $700 tank tops can’t be loving genuinely can they? Aren’t they isolating themselves from their lowly minimum wage earning church members and book readers? Isn’t this what Paul is talking about when he says do not be haughty or wise in your own eyes? But PreachersNSneakers not only reminds us of a danger, it also creates a danger. The danger of the very thing it’s calling out. Every time I see another picture of a well-dressed mega church pastor my self-justification kicks in. “At least I’m not that vain…right?” But now who’s not living in harmony with one another? Who’s wise in his own sight? This guy. Live in harmony with one another: Literally “have the same mind toward one another.” In other words, see everyone as the same in Christ. Embrace equality. Promote unity. Do not be haughty: Literally “do not be high minded.” Full of yourself. A snob. Don’t think you’re better than everyone else. associate with the lowly: Be submitted to, connect to, be friends with everyone, including the poor. Or Paul might mean here “do the lowly tasks.” Either way, be humble. Never be wise in your own sight: Don’t be opinionated, hard headed, or argumentative. “To live is Christ” is the antidote for our superiority. The same Jesus died on the same cross for the same sins for all of us, regardless of our social status. Any status, position or power that we have in this world is by the grace of God. The indwelling life of Christ makes all of us equal in him. We are equally IN CHRIST and Christ is equally IN US. There is no greater cure than the gospel for the plague of self-righteousness. Humble genuine love is our only appropriate response to others in this life. May the life of Christ in us daily purge us of all sinful pride and conceit. And may the love of Christ produce the harmony that is so desperately needed in our hearts, churches, communities, and nations. Amen. Previous Previous post: April 12. Romans 12:15. How to Love part 12: Empathize. Next Next post: April 14. Holy Week Day 1 Palm Sunday: A Place for the King.